How to give an amazing talk — Work Smart and be Remarkable! If you work in academia you have to give a lot of talks. While many people dread it, I love doing it. I would consider myself even a little bit of a presentation geek. I try to give quite a lot of talks ranging from lectures, presentations of our work in front of research groups, for stakeholders from industry, at Science festivals, and in front of school kids. This year I even gave a talk in a pub at the Pint of Science festival. I truly believe you always should give your best possible presentation. You owe that to your audience. They have decided that the best thing to do right now is to listening to you. It is your responsibility to make it worth for them. It is also a wonderful opportunity to inspire and to connect with people. You never know who is sitting in the audience and I have been given so many great opportunities by people coming up to me after one of my talks. In my experience giving presentations is one of the best ways to engage with people. To ensure to give the best talk possible, I apply a couple of basic rules and a handful of tricks, which I am happy to share here with you. It is quite obvious that there is a huge difference between giving a talk in front of school kids and a presentation in front of your peer. However, more often than not there are subtleties when it comes to different audiences. Knowing the background and their level of knowledge of your listeners will enable to connect with them. "Giving a talk is not about convincing somebody. It's about making a connection and to inspire." It is your job to take the audience from the place where they are and lead them into your world. Knowing them as much as possible will enable you to use words and concepts they can relate to. It also helps you to find relevant examples. Ask yourself, what are applications of your work that they could use in their lives? Make it relevant for your audience. Why should they care about what you have to say? For invited presentations I try to learn about my audience from my contact person by specifically asking them to give me more information about who will be there. In addition, I browse through their webpages to learn about their research and try to find connections to what I am going to talk about. The key here is to make it as relevant as possible for your audience. Otherwise you will loose them and you would have missed a wonderful opportunity to connect and inspire. By the way, also make sure you know the venue as well. If it is on campus go to the lecture hall a couple of days before (check the time table to make sure it is free) and get a feeling for the space. Walk around. Make it your place. Also take this opportunity to test your equipment. In case you travel to an invited talk, ask your host to show you the room where you are going to give the presentation. A good way to tell them is by asking them to let you test the equipment. The main reason why a lot of talks are boring is that they lack a consistent message. Yes, there is a motivation and there are results, but there is no clear message. People want to know, what does this mean for me? Note that it doesn't matter if you have school kids or experts from your field in front of you, they all want this question to be answered. How you address them, will be of course different. Start with a clear message, then make your slides. Before you start to work on the talk make sure you have a message that can written down in 1 short sentence. If it is a paragraph long, it's not a message, it's a summary. Cut it down. Get to the core. You can ask yourself, if the audience won't remember anything from your talk, but just one sentence, which one should it be? This is one of the toughest parts of preparing a talk. I am sure you have a whole list of interesting points and exciting results that you want to share, but you will have to boil it down to a single sentence. It is hard, but believe me it is necessary. You can later add parts that support the message (but only those!) to build up your presentation. People are different. And so are people in your audience. Some are visual learners, while others get the message more by speaking it out. Make sure you convey your message in various forms. Show an inspiring photo, tell a personal story, play a video clip or pieces of sound or combine them – be creative! You can even dance the message as people have shown in Dance your PhD competitions. Also consider, especially at international conferences, some people in your audience might be really tired and/or jet-lagged. Make sure you repeat your message. Redundancy is good, as long it is not boring. Your audience will appreciate that. One of the best ways to convey a new concept (as well to repeatedly tell your message), is by giving examples – lots of examples. Start with a very simple one and then increase the complexity step by step. Don't worry about oversimplifying when you start out. In the academic context a suprisingly big number of speakers are afraid of being perceived as not being sophisticated or not precise. Don't worry about that. A good example is one that the audience can relate to, not one that is "correct" in every detail. Engage with the audience and let them know about your approach. You can say, for example, "Let's start with a simple example" or "For the sake of simplicity". As previously pointed out, take the audience's background into account. For example, when I talk about soft robotics to school kids, I talk about Baymax from Big Hero 6) which is very different from Wall-E or the Terminator. On the other hand, when I talk in front of biologists, I talk about how much better animals are than any state-of-the-art robot. 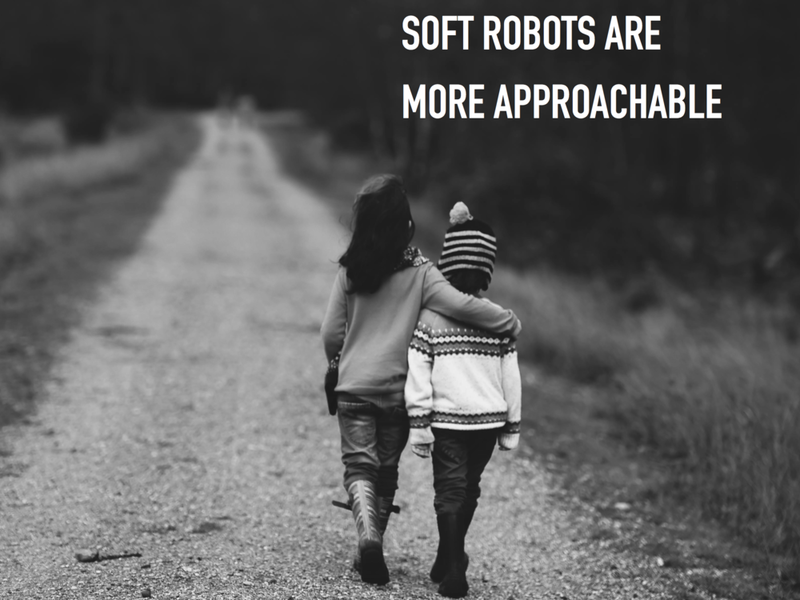 Furthermore, I remind them that almost all animal bodies are very soft and how that is very different from the way we typically build robots. Often the beginning of a talk can be shaky. You are nervous. You are getting introduced and suddenly everyone is looking at you. You don't know your audience and have not made a connection yet. You feel vulnerable and exposed. A great tip to overcome this anxiety is to learn your first 30 seconds by heart. It gives you confidence and it provides you with a buffer to get comfortable. If you have a great start, you will have a great talk. You don't have to think about your sentences. It gives you the time and mental space to assess your situation, to look into the room and connect. You will gain confidence and you will give a great talk! For beginners, make also sure your first couple of sentences are independent from how you got introduced. For example, it can be quite awkward when you had planned to start with "Welcome my name is Helmut Hauser and I am from the University of Bristol", but they have already introduced you with the exact same information. A small variation can help you to solve this issue. For example, you could say, "Thank you for this wonderful introduction. As you have already heard, I am Helmut Hauser and I am from ..." With more experience you will be able to do that on the fly, maybe even react directly what has been mentioned in the introduction. However, for beginners a well prepared start is quite helpful. If possible, make the talk personal. Share a story. Open up and be vulnerable. It is OK if you feel a little bit uncomfortable doing so. The audience wants you to do well and a personal story is a great way to engage. It also shows that you really care about the topic. The best stories are, where you share a failure. Whatever you do, don't exagerate or lie. The story has to be authentic. Don't make one up just for the sake of having a story to tell. In the academic context it is not always possible to connect to a personal story. But you can still show that this is personal to you. Show them your excitement. Tell them why this result or insight is so cool or why the outcome was frustrating! Don't be afraid sharing your emotions with the audience. I am sure you have seen quite a lot of talks with really, really bad slides. Often they are showing way too much information or they consist only of boring bullet lists. Some slides are even straight out ugly. How do you feel sitting in the audience and looking at those slides? Do you feel appreciated or do they make you cringe? Do they make you more open minded about what the speaker had to say or do you feel a resistance building up? Slides are like giving a first impression. They are not more important than the message, but they play a crucial role to get people listening to you. Beautiful slides are a way to say, this is important. I took the effort to put it into a clean and beautiful form, because it matters. For Mac users I recommend to use Keynote. It includes a whole range of incredible good looking templates made by professionals. Don't change their fonts or coloring. Choose one template and stick with it. For public presentations, where I don't talk so much about specific research results, I use big, beautiful pictures and I add just a couple words here and there. A picture says more than a thousand words. One of the greatest sources of beautiful high-res pictures published under Creative Commons Zero (basically meaning you can do anything with them) is Unsplash. Another one is Pexel. Below you can see a couple of slides from a talk that I gave at the Pint of Science festival using pictures from Unsplash. Click on the pictures to see more slides. If you want to learn more about making great slides and read about many other great tips on giving presentations you should check out the book "TED Talks: The official TED guide to public speaking" by Chris Anderson. It is always a little bit awkward when you see people skipping a couple of slides, because they don't have enough time to go through everything. Another embarrassing moment is to see people peeking to the next slide to see what they will have to say next. You also might have seen speakers who simply read from their slides. What they all have in common is that they are all not well prepared. Don't make this fault! Practice your talk over and over again. Make sure you know what is on your next slide and that you know exactly what you want to say at every point in your talk. This will give you confidence, which is crucial to give a great presentation. However, it will help you even more. Having practiced a lot will provide you with enough structure to wing it when necessary. To avoid running out of time, I go through parts of my talk and stop the time I need for them. Usually I have a text document in nvALT with all the information about my talk like starting time, abstract that I sent them, title, venue, information about audience, but also, a list of my timing. Below you can see an example of such a list. This also allows me to remove or add parts from older talks to hit the target time. For example, if I know the presentation of a specific results takes me 5 minutes, I know immediately, if I can add it or not. If you want to know about other great uses for nvALT in academia have a look at my blog post. Another part of your preparation should be to check if your videos play and if your connector and remote control are working. Also make sure you switch off all unnecessary applications. You don't want to see the audience your latest cat video from YouTube or a private email. I have written a small AppleScript that I call via Alfred that switches off all these applications at the same time for me. You can check it out in my other blog post [link]. When I give talks in front of my academic peer I often prepare some extra slides with more details on a mathematical proof or an experimental or simulation setup. I also have additional slides on further results and videos. I put them right after my final slide to access them easily, but I show them only to address (common) follow-up questions. They serve the same role as an appendix in a publication. I put there everything that is too complex or too detailed for the main presentation. Over time I was able to build up a whole library of slides that are able to cover a wide range of the most asked questions. I also use them as a tool to facilitate follow up discussions that happen often offline after the talk. Make sure they are also as clean and professionally looking as the rest of your presentation. Often these slides are the last impression the audience will get from you. This was just the beginning. There are so many more layers to giving a good presentation. Here are just a couple of smaller tips. Talk slowly. You should talk much, much slower than you would think itis appropriate. Try it out with somebody and see how slow you can get without being perceived as weird. You will be surprised how slow you can get. Use your body. Tell your story not just with your hands, use your whole body. The bigger the audience the bigger the gestures. Pause. Make a lot of pauses. This gives you time to think, but more importantly it gives the audience time to think about what you have just said. Eye contact. Look at people. Start with one, pause a little bit and then move to another person. Talk directly to one person at a time. If you are nervous, come back to known or friendly looking faces. Practice. Like with every skill, you get better by practicing. Volunteer to give talks. The more the better. Experiment. Try out new approaches and techniques and see if they work for you. You have to feel comfortable with them. Otherwise don't use them. Try also different presentation formats, like Pecha Kucha or Ignite). Get support. Join a presentation club. For example, have look at Toastmasters. They are world-wide available and have a great reputation in helping people to get excellent in public speaking. Observe. Watch other people giving talks. Note what you like and what they did wrong. Did they engage you? How did they do that? Video tape. Take a video of yourself and watch it. What could be improved? Improve. If you give talks on similar topics, which are the most common questions afterwards. How could you improve your slides and the way you presents them to avoid these questions? Equations. If you need to add equations to your slides check out my blog post on how to make LaTeX work with Keynote.